Getting clicks and opens sometimes seems like an impossible task for digital marketers. When you go through your inbox, you probably pay close attention to only a few emails — maybe 10 percent. What went wrong with the 90 percent of emails that you didn’t engage with? Maybe they didn’t have great copy or design, or you didn’t like the sender’s products or services. Maybe you don’t have a trusted relationship with the senders, and those emails just got lost in the sea of emails in your inbox. You have about three to four seconds to grab your reader’s attention, so a great subject line, perfect copy and design, and an awesome promotion aren’t always enough. That may seem a bit unfair. Get the timing right. Send your emails at times when others aren’t sending email. Then your emails will stand out in people’s inboxes and get a higher open rate. We’ve found that the best times to send emails are from 8:30 to 10 a.m., 2:30 to 3:30 p.m., and 8 p.m. to midnight. Call people by name. Our research shows that emails with a first name in the subject line garner a 23 percent higher open rate. That’s an amazing boost, but don’t use this trick too often. It loses its effectiveness if overused. Be positive in the morning and negative at night. Most people wake up bright-eyed and excited to face the new day (okay, after you’ve had your coffee). Take advantage of that fact by sending positive email messages during the morning hours. In the evenings, negative messages are better accepted. If you’re going to send a negative message — perhaps about a declining market or an urgent need — make sure that you offer a solution to the problem as part of your email. No one likes to be made to feel hopeless. Be controversial or relevant. Stand out in the inbox by bringing up controversial topics (even if you worry that some of your subscribers won’t agree with you) or relevant content. Use odd or specific numbers. Everyone has ten tips for doing just about everything. Try using different numbers: “6 ways to change your business tonight,” “14 simple ideas to teach your child math,” or “The $234,423 idea that changed everything,” for example. Never round up your numbers up. Doing that makes you sound like a liar. If you have only nine amazing ideas for holiday décor, say you have nine amazing ideas. Saying that you have ten and then delivering only nine makes you look dishonest. Keep your subject line short. The best subject lines have six to ten words, or 25 characters. Short subject lines are easy to read and view on a smartphone while still piquing customer interest. Use a second subject line. Most email providers have a second area of displayed content on every email. In many email systems, this area is referred to as the description, but if it’s left blank, it defaults to the first line of copy. Instead of accepting the default, write a second, strong subject line and place it in the description section to tell your customers more about your email’s content. Include symbols in the subject line. Using a symbol in the subject line can increase opens by as much as 15 percent. This symbol can be professional, such as a copywriting symbol, or playful, like a snowman for a winter holiday promotion email. You can find loads of great symbols to use in subject lines at emailstuff.org. The site offers cool things like a clock to symbolize a sale that’s about to end. Tick-tock. Press Play. Instead of including a link, embed a still image of a video with a Play button superimposed on top. This technique can dramatically increase click-through rates in email campaigns. Ask customers for their thoughts. This strategy results in the highest click-through rate of all campaign types, so you can replicate it and get high click-through rates on emails again and again. This strategy involves asking a question and listing four to five answers, each with a link. All the links go to the same place, where customers can find answers to the questions. An example of a “Your Thoughts?” email that engages the audience. Combine video and questions. Video consistently yields high click-through rates and high customer engagement. 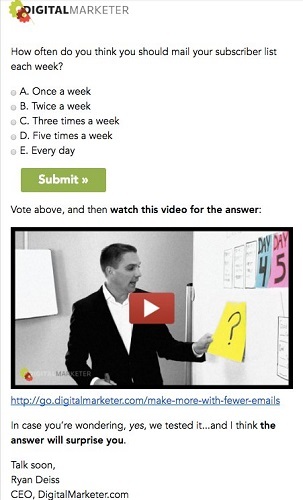 Include a video and a “your thoughts” question in an email, and have subscribers watch the video to get the answer. Many marketers worry that they don’t have the charisma or budget to make highly professional video. Don’t be afraid! Because email is about relationships, a simple conversational video can show your personality and voice to your subscribers, and allow you to connect with them in a new way. Add a countdown. Phrases like “Four days until this sale is over forever!” and “You’ll never get this deal again!” increase the urgency of the promotion. You can increase the urgency even more by adding a countdown clock or timer to show customers exactly how much time they have. Use animated GIFs. Pretty or funny moving images in an inbox catch people’s attention. If you have access to a designer who can make custom animated GIFs, have that person create some for you. If not, sites like Giphy offer free GIFs that you can use to give your emails an extra edge.